Zaha Hadid, First Woman To Win Pritzker Prize, Dies At 65 : The Two-Way Hadid was first famous for spectacular designs that were never built — but later proved her ideas worked in the real world, not just on paper. She was the first woman to win the Pritzker prize. 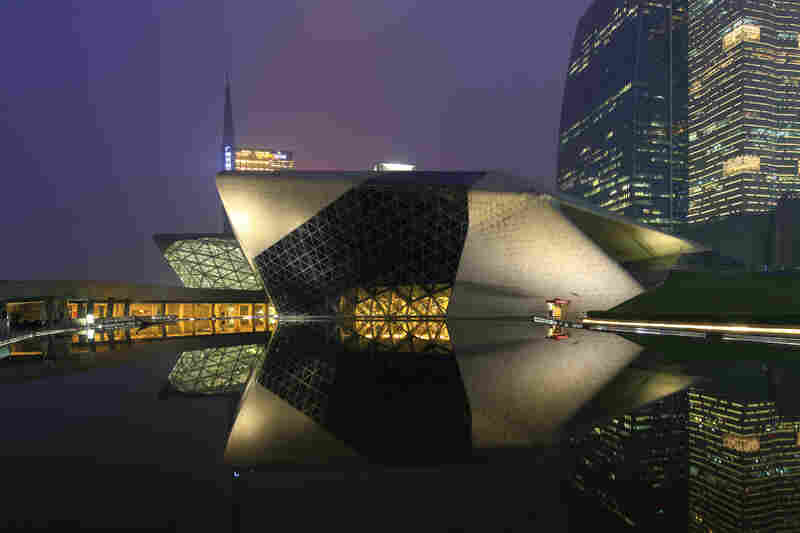 Guangzhou Opera House in Guangzhou, China, was designed by Zaha Hadid, a Pritzker-winning architect. Hadid died at 65. 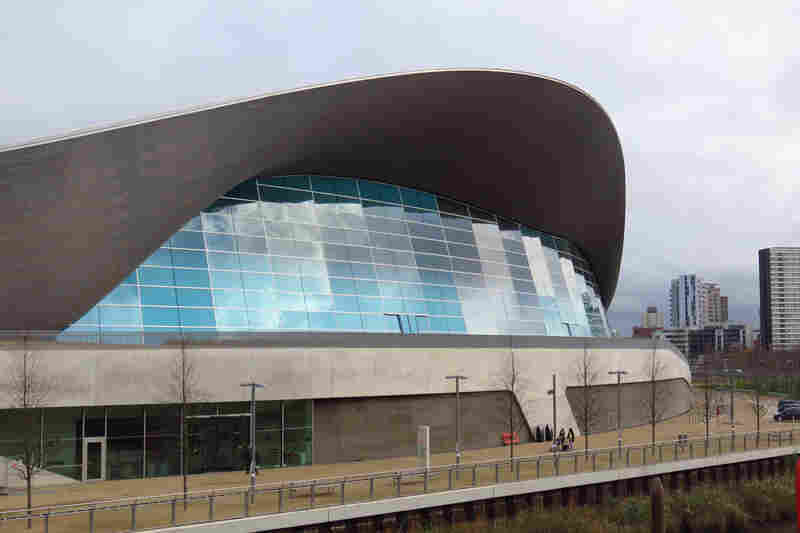 London Olympic Aquatics Centre was designed for the Summer Olympics in 2012. In addition to her design work, Hadid taught architecture around the world. 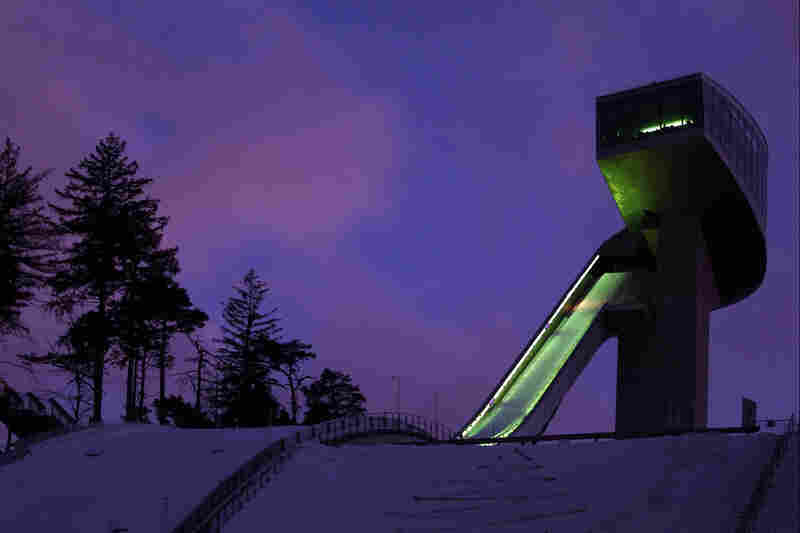 A view of the Bergisel Ski Jump during the 2012 Winter Youth Olympic Games Opening Ceremony in Innsbruck, Austria. Cars drive past the Lois and Richard Rosenthal Center for Contemporary Art in Cincinnati in 2003. 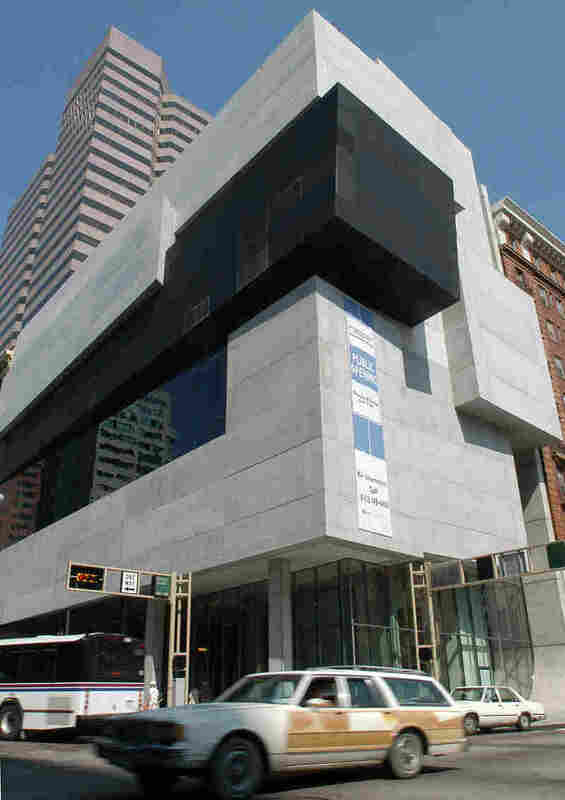 The Contemporary Arts Center, founded in 1939, was one of the first institutions dedicated to exhibiting contemporary art. 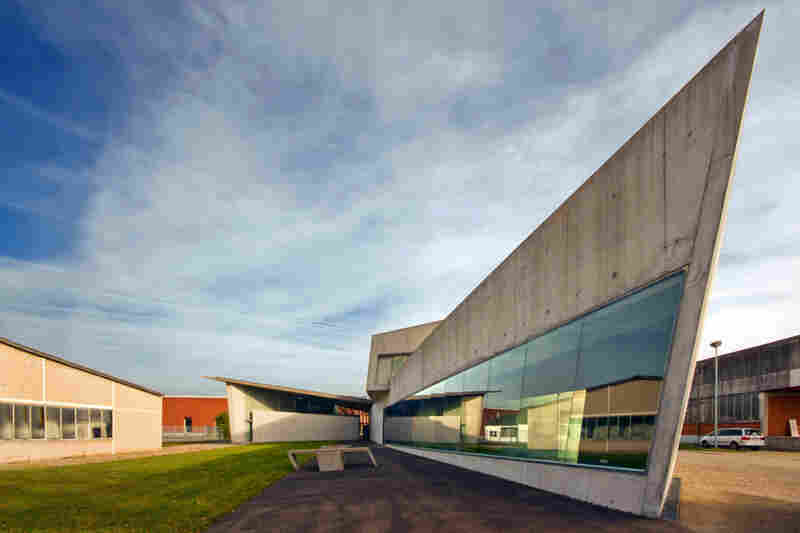 Vitra Fire Station in Rhein, Germany. The fire station — now a museum — was one of only two of Hadid's building designs that were actually constructed before 2000. Hadid was born in Iraq. In a Fresh Air interview with Terry Gross in 2004, she said that her contemporaries had a fundamentally inaccurate understanding of the Arab world she grew up in. "Many women went into university and higher degrees and worked in variety of professions," she says. She went to a Catholic school, despite being Muslim, and her parents always encouraged her academic ambitions, she told Gross. Hadid went to school in Beirut, where she studied math, and London, where she later settled. In 2004, she told Edward Lifson of Chicago Public Radio that she had wanted to be an architect her entire life — since she was 11 or 12. And after studying at the Architectural Association in London, she launched her own practice in 1979. She quickly became famous for striking, dramatic and experimental designs — often dismissed as impractical or impossible to build. Zaha Hadid stands before the Riverside Museum, her first major public commission in the U.K., in Glasgow, Scotland, in 2011. Her first major design, in the early 1980s, was for the Peak Leisure Club in Hong Kong. She envisioned a gravity-defying, jagged-edged structure perched on top of a mountain. It won a competition for the building's design but was never built. A decade later, Hadid envisioned an angular auditorium for the Cardiff Bay Opera House. That, too, won the design competition for the project but was never built. "It would have become the most radical and compelling building in Britain," The Guardian's architecture critic, Jonathan Glancey, wrote in 2011, "but an alliance of narrow-minded politicians, peevish commentators and assorted dullards holding the Lottery purse strings ensured it was never built." In fact, despite numerous high-profile designs, only two of Hadid's building designs were realized before 2000: an eight-story housing project in Berlin and the Vitra Fire Station in Weil am Rhein, Germany. In the past 15 years, though, Hadid proved her radical, deconstructivist designs worked as physical buildings — not just as experimental drawings. You can step into Hadid's designs at, among other places, the Lois & Richard Rosenthal Center for Contemporary Art in Cincinnati; the Bergisel Ski Jump on Bergisel Mountain in Innsbruck, Austria; the London Olympic Aquatics Center for the London Olympics; the Maxxi contemporary art museum in Rome and Eli; the Heydar Aliyev Cultural Center in Baku, Azerbaijan; the Guangzhou Opera house in Guangzhou, China; and the Edythe Broad Art Museum at the Michigan State University campus in East Lansing. But her work wasn't reserved for high-profile stadiums, artsy opera houses or museum buildings. She also designed the King Abdullah Financial District Metro Station in Riyadh, Saudi Arabia; a BMW plant in Germany; a shipping firm's headquarters in Marseille, France; a cancer counseling center in Kirkcaldy, Scotland; and several train stations in Austria. In 2004, Hadid told Gross she believed even her most radical ideas weren't meant just for critics and highbrow art consumers. "I'm not saying it's because ideas are kind of a bit crazy that it's suitable to only art institutions. I think they could be tried out equally well for, you know, corporate work or for housing or parks or whatever," she said. And she told Lifson that she thought about public enjoyment, not just dramatic lines, when she crafted a design. "I think that people want to feel good in a space," Hadid said then. "Architecture on the one hand is about shelter, but it's also about pleasure, and I think ... the more you carve out of city civic spaces and the more it is accessible to a much larger mass and public, then it is about them enjoying that space. That makes, you know, life much better." Her design for the 2022 World Cup stadium in Qatar is currently being built — amid controversy over the working conditions, as multiple laborers have died working on the stadium project. Hadid's comment on the issue of laborer welfare in Qatari projects — which included, "It's not my duty as an architect to look at it" — were widely criticized. Hadid sued one critic for defamation. While Hadid's work in recent years has moved from concept to construction far more frequently than it used to, some high-profile designs have still been scrapped. An Olympic stadium for Tokyo was designed, then ditched, after the cost ballooned to $2 billion and members of the public mocked the building's appearance. In addition to her design work, Hadid taught architecture around the world. She was appointed a Dame Commander of the Order of the British Empire in 2012. 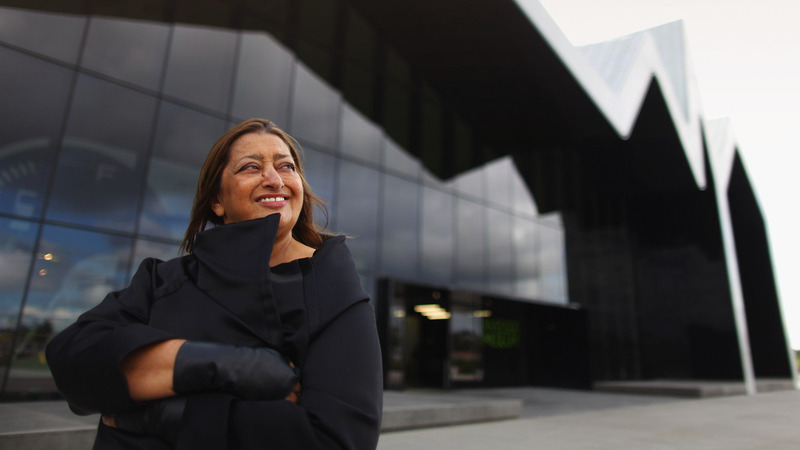 Hadid won the prestigious Pritzker Architecture Prize in 2004; she was the first woman to do so. She told Gross that being a woman — and, on top of that, being a foreign-born woman — had been a challenge in her career. "If I went to a meeting with even an assistant of mine, to the side they will talk to him and not talk to me," she told Gross." I mean, there's a world which you, as a woman, no matter how successful you are, you can't enter into. You are not part of a network. "It takes you a long time, let's say, to come over these things. I mean, I never thought it'd be a problem because ... for good reason or bad reason, I always thought, you know, I should do well because the work is good."